The Petroleum & Convenience Marketers of Alabama is a nonprofit trade association serving over 350 petroleum marketers and convenience store operators across the state of Alabama. The association has member companies owning, operating and/or supplying more than 4,000 convenience stores in Alabama. P&CMA members are major-branded and independent or private-branded petroleum marketers and owners and operators of retail convenience stores in Alabama. The P&CMA is owned and operated by its members through an elected board of directors. The policies of the board of directors are implemented by committees and by the association’s full-time staff in Montgomery. The association also has an additional 120 member companies falling into the associate/affiliate membership category. This category is reserved for vendors and suppliers to the membership of petroleum marketers and retailers. Formerly the Alabama Oilmen’s Association and the Alabama Association of Convenience Stores, the association changed its name in January, 2002 to more succinctly describe its core membership after a number of mergers of various organizations representing the petroleum marketing and convenience store industries. The Alabama Oilmen’s Association (AOA), incorporated in 1984, was the product of a merger of two well-established jobber organizations – the Alabama Petroleum Marketers Association, which was formed in 1949, and the Independent Oilmen’s Association of Alabama, formed in 1966. The Alabama Association of Convenience Stores was formed in 1979 and merged with AOA in September 1991. The association exists to preserve the private enterprise risk-reward system; to ensure a favorable competitive climate in the wholesale and retail distribution of petroleum products and to support the growth of the distribution system in Alabama through retail gasoline outlets and convenience stores; all to the end of better serving the citizens of Alabama. The major emphasis of the association is the dissemination of the rules, regulations and legislation which affects our members as well as providing for the educational needs of our members at the state level. The Petroleum & Convenience Marketers of Alabama serves its member companies by promoting a favorable business environment through advocacy, education and services. 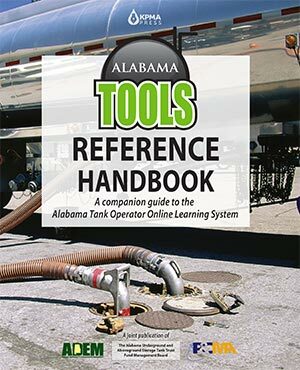 This system is made up of printed, online and live educational sessions designed to provide tank owners and operators with a basic overview of UST/AST systems.